PUERTO PLATA- The brand new, $30 million Ocean World located in the exclusive Cofresi resort area isn’t about just sitting around and watching “Flipper” dance on his tail in the water — it’s about jumping in and dancing with him. And it’s not about strolling past gigantic aquariums teeming with coral reefs and tropical fish and sharks— it’s about actually getting inside the aquarium and swimming with them. “This is the first park of its kind, where you’re interactive with all the animals sea lions, dolphins, sharks, stingrays, tropical fish and tropical birds,” says Eric Bogden, director of operations. Eric is an18-year veteran of Sea World parks in the States. He was netted by Ocean World’s owners to manage the design and completion of this unique park’s exhibits. This is the second park operated by the same owners. Their first one, Dolphin Encounters, is a huge success located on Blue Lagoon Island near Nassau. Ocean World is brand new and some of the exhibits will open over the next several months. “We’re training the sharks right now. Just this morning I had one sitting on my lap,” says Eric proudly. When the shark pool is ready, your friendly shark will stick his jaws out of the water for a photo op with you. Open a scant six months, the dolphin swims and encounters are already selling out, attracting more than 100 people per day. Dolphin Swims, the ultimate experience where you actually get towed around the lake by a friendly pair of dolphins, are limited to 10 people twice daily, and are sold out more than a week in advance. And while we had to settle for a Dolphin Encounter, where up to 30 can participate; it turned out to be an unforgettable experience just the same. Indeed, this isn’t about sitting in bleachers and watching animal tricks from a distance. This is about getting into your bathing suit and sitting with just a couple dozen people on a floating deck, with three trainers attending and three dolphins sharing an enclosed pool not much larger than a jacuzzi. This is about standing in shallow water as a 400-pound dolphin comes up erect in front of you. You hold his fins, and, as the trainers whistle a quick five bars of merengue, you feel the power as he dances in your outstretched arms. This is about standing in shallow water as Boomer, the newest arrival at Ocean World, comes right up to you for a hug, pressing his body against your chest, head on shoulder. And you feel the strength, the power and the gentle affection of these incredible mammals as they wiggle their snouts against your cheek for a friendly kiss. Ocean World has become a must-see in Puerto Plata. It’s open every day but you’d do well to reserve in advance. OCEAN WORLD ADVENTURE PARK is the most advanced marine interaction park of its kind. Boasting the largest man-made dolphin habitat in the world, Ocean World is a must-see attraction for everyone visiting the Dominican Republic. Sea Lion show & Encounters. The Patagonian Sea Lions featured in this program originated from Uruguay. Two of them are male and six are female. Guests are provided with an opportunity to touch, feed, pet and play with these wonderful animals in the Sea Lion Encounter Program. The Sea Lion Show draws great reviews as guests watch the animals perform amazing behaviors and stunts. Dolphin Swims and Encounters. For many guests, the highlight of a visit to Ocean World Adventure Park is the rare opportunity to swim and play with beautiful Atlantic bottlenose dolphins. The Dolphin Swim experience begins with a brief orientation and educational program. Then guests enter the water for their introduction to dolphins. Guests learn about dolphin behavior and discover how Ocean World Adventure Park trainers use hand signals and positive reinforcement to communicate with them. Taking the experience one step further, guests encounter, kiss, hug, pet, and feed dolphins one on one in their environment. Shark Encounters. The sharks at Ocean World Adventure Park are an exciting variety of nurse, bonnet head and brown sharks; all indigenous to local waters. This rare award-winning interactive program includes touching, petting, feeding and snorkeling with the sharks. Stingray Encounters. Guests wade into the Stingray Basin, float and interact with the stingrays. These fishes, which glide gracefully through the water, will provide you a really unique and memorable experience. Tiger Grotto. The highlight of the Tropical Rainforest is the tiger grotto. Here, guests are invited to take a refreshing dip in the water next to the tiger habitat separated only by glass! The pool stretches out toward what is reminiscent of ancient ruins overgrown with thick vegetation and waterfalls. SCUBA with the Dolphins or Sharks. New and exciting programs have begun at Ocean World Adventure Park; the fantastic once-in-a- lifetime opportunity to interact with dolphins or sharks underwater. In these incredible programs visitors put on a wet suit and SCUBA gear then become immersed in an underwater paradise. The staff of Dolphin SCUBA offers instructional programs that prepare guests with the PADI open water SCUBA certification required for these programs. Almost all of the famous brand name cigars sold in tourist shops – Cohiba, Davidoff, etc. – are knockoffs or counterfeits: you pay for the name but you don’t get the real thing. Much of the product available is simply unknown to the buyer and sold at prices that don’t necessarily speak for the quality, and with no way to try before you buy. There is nothing worse than buying for a cigar-loving friend back home, only to find out too late that you have bought him a box of junk. We concluded that there must exist in the Dominican Republic a cottage industry of highly talented cigar makers who can make an excellent cigar and whose prices reflect the fact that they are not well known. After all, there are dozens of cigar manufacturers in the Dominican Republic. 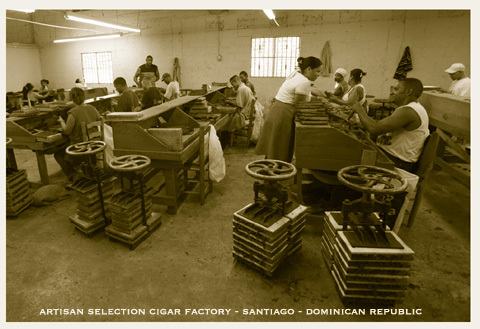 Many have come from Cuba, others have been professionally trained in factories located near Puerto Plata that produce some of the world’s most famous cigars. So we set out to try to find one of these unknown talents. As for the quality of the ‘smoke,’ our criteria was simple: the cigar would have to be a comfortable smoke, meaning an easy draw, a good burn and a flavor that wouldn’t knock the bejeezus out of your taste buds. In short, we were looking for a decent cigar at a decent price that would be both satisfying for the beginner and respectable to the connaisseur – something you take home to father-in-law and he actually thanks you for it. The final criterion for us was consistency in product. One problem with cottage industries is that a well-meaning beginner might put out a good product one day, yet prove unable to keep up with his own success. We wanted a source that could provide reasonable assurance that next month, next year, we could buy the same cigar we enjoyed before. As it turns out we didn’t have to go out looking for this because it ended up coming to us. One Sunday a regular client of Café Cito, Robert Daoust, showed up for a leisurely afternoon lunch with an associate of his, Don Luis Cuevas. Robert is a Canadian businessman who over the last few years has developed his own brand name, ‘Don Roberto,’ and started a distributorship out of Montreal that today spans the country. While operating on a much larger scale than us, he had the same objectives; a good smoke, a good price, consistent quality. Several years ago and after a few false starts, he found what he was looking for in Don Luis, a virtual walking cigar encyclopedia who heralds from the famed tobacco region of Pinar Del Rio, in Cuba, where his family’s tobacco plantation traditions go back three generations. 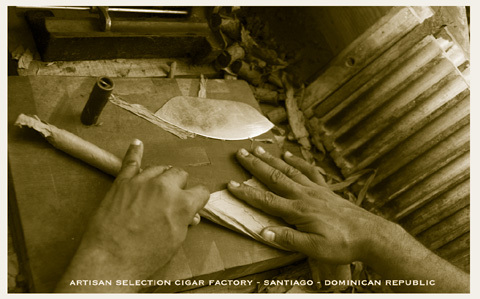 Don Luis has been producing cigars in the Cibao region of the Dominican Republic for the last twenty years. He found his niche in the anonymous side of the business, that of running a factory and making cigars for other people who have their own brand names and distributorships in different parts the world. Along the way he also developed his own line under the name Cuevas Hermanos. Some very respectable brand names come out of the Cuevas Hermanos cigar factory, brands that are well known throughout Europe, North America and The United Kingdom. During a visit to Luis’ factory, we leafed through a couple of issues of Cigar Aficionado Magazine. In each issue, they publish a rating of different cigar brands in a single category or size. In this rating system, anything from 90 to 100 is considered outstanding, 80 to 89 is considered very good to excellent. Below seventy means not recommended. In the issues we looked at, we found at least a half dozen of the brands produced at the Cuevas factory; many scored in the high 80’s – excellent. “We have been coming out on those lists ever since 1994,” he says. Considering that cigars that rate in the 90’s are either impossible to find or tremendously expensive, Don Luis’ high-eighties ratings convinced us that indeed he had a product that promises consistently high quality. All this of course was merely confirmation of what our own experience had told us when smoking his cigars. Over a year of Don Luis’ occasional visits to Café Cito, we had tried a variety of his cigars and also gave several dozen away to our cigar-smoking clients. Everyone agreed that Don Luis’ cigars were very well made, burn evenly and draw nicely. Even people who weren’t veteran cigar smokers found themselves, not with a half-smoked cigar in the ashtray, but puffing away right to the very end.